In late 2011, I got a random email from someone named Gabriella West. She was responding to my request for reviews for my third book, Are You Sitting Down?. When I discovered she was also a published author, I offered to review her book, The Leaving. I remember it well because it was the first book I read on my iPad. I immediately became wrapped up in the story and really admired Gabriella’s style. Needless to say, I’ve read practically all of her work since then. And the best part of this introduction is that Gabriella and I became pen (email) pals and have emailed each other about once a week, sometimes more, ever since. So we know quite a bit about each other and yet we have never met face to face or spoken to one another. Gabriella has also since become my editor. So on both a personal and professional level, I have the honor of calling her my friend and I’m so glad she decided to submit a Write or Wrong piece. You can find Gabriella’s editing services at Edit for Indies or find her online here. I’ve enjoyed reading the previous posts in the Write or Wrong series. If I take one thing away from these posts, it’s that despite all the ambivalent feelings that swirl around this occupation/vocation, we each find a way to make writing work for us somehow. For me, there are two things that have been really important as a writer. Finding a community of peers: a writing group. And living in a place that I felt was beautiful and inspiring. Where I felt comfortable and stable. It’s asking rather a lot, isn’t it?! But it seemed easy at first. I came to San Francisco to go to graduate school in a two-year creative writing program, though my intent was to stay permanently. I was very young, only 21, fresh out of college in Ireland. Most of the other writers were much older. They seemed a bit careworn to me, but I liked that. I felt we were serious about our writing and were there to learn and help each other, for the most part. Because I had never had my work critiqued before, the fact that some people thought I had talent was a revelation. Before I left that program, a writing group started up that I remained a part of for the next ten or twelve years. Which seems amazing to me now. I have lived in San Francisco since 1988, and the first ten years, looking back, were about me trying to put down roots. I really loved the city, which was full of “alternative energy” then, and I had a wide group of friends. I found a university job in 1992, where I stayed for five years. It wasn’t well paid but I had benefits. Movies were cheap; I went to a lot of them. I always seemed to have money to go out and do something artsy, though I didn’t have nice clothes or a good car, for example. Rent was affordable. This was because I lived in a tiny cabin in the courtyard of an old house in a folksy neighborhood called Bernal Heights for over ten years before I got my first one-bedroom apartment on the same property. 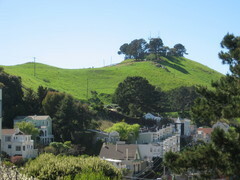 We lived up against the side of Bernal Hill, a rocky outcropping preserved by the city as open space. If I felt tense and disconnected, I could just go walk around the hill. I desperately needed to feel at home in my surroundings, but as the years went on a funny thing happened. First of all, my friends drifted away for work or cheaper housing. My first writing group turned slowly into a therapy group, where I was the only one who still brought material to read. The other women talked about their difficult lives. I felt more and more uncomfortable in that group, but it meant so much to me because of the history and the continuity that I couldn’t conceive of leaving. Finally, after some personality conflicts, the group asked me to leave. There is a lesson here, something to the effect of: Things change. By choosing to stay in what I perceived as a good situation too long, I kept getting the message to move on. And that was an unbelievably painful message to hear back then. It was during that difficult period in the mid-2000s, where I felt trapped with no idea where to go next, that I read Julia Cameron’s advice to writers who are unhappy where they live: “Bloom where you’re planted.” Her counterintuitive advice was to stay put and try to make it work. So I’ve done that for the last ten years, while the city has continued to change around me. It’s not just my story. Artists and writers have been priced out of San Francisco. The tech industry has, to some extent, ruined everything and sucked the soul out of the city. Even the gay community seems jaded and exhausted. Unlike the charming, open vibe that once existed, people seem actively unpleasant to each other now. It’s no coincidence that ugly high-rise apartment buildings are springing up everywhere and that longtime tenants are being evicted, only to find that they have nowhere to go. I, too, eventually had to leave Bernal, which has become a “hot spot” for tech folks to live. So, yeah, I feel dislocated. Out of place. What I would love to find is a place that feels “right.” San Francisco did feel right to me once. It’s easy to forget this. I suppose I thought it would be a lifelong love affair. No one could ever have predicted it would change this much. The good energy’s gone here. Sometimes it just happens like that. Recently I went to Portland, Oregon, for the first time, for a writing conference. I was struck by how I was treated there: normal, friendly. I didn’t have to don armor before going out. People were spontaneous, and strangers spoke to each other at bus stops. “It’s like being back in the ’90s!” I thought one day. There was a sort of social contract in the way people treated each other, one that’s been completely wiped away here. I suppose Portland will inevitably become more elitist too, because it’s going through a boom right now. Still, I would like to try it. I can so identify with this! I lived for years in Colorado, which I loved, and have now lived for years in Florida, which I don’t love. I can’t help but think I’d feel more inspired if I could look outside and see something beautiful. I hope you find your place soon, Gabriella. It’s sort of painful to not have one, isn’t it? It is painful. But you have been writing a lot in Florida, haven’t you, Melinda? I find it interesting that we writers can keep working in places where we don’t feel particularly happy. I constantly think about how I’m here in St. Louis yet most of my writing takes place back home or in Memphis. I have yet to write about here, and have no desire to really. But I do wonder if that would change if I ever left St. Louis. Our “place” certainly has an effect on our writing regardless if we are there or not, doesn’t it?